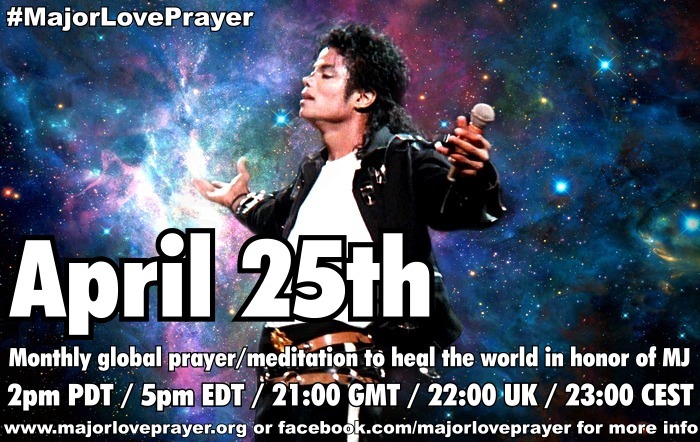 Please join us wherever you are this Saturday at 2pm Pacific Time as we bow our heads in a simultaneous global prayer of love, respect and thankfulness to Michael Jackson, and as we connect around the planet to heal each other and the world with love. We're sending out a major love to Michael, his family, our fan family and all the world. Throughout the day Saturday we will be posting many beautiful tributes to Michael, then at prayer time we are asking fans everywhere to join with us for a very special 3-part Major Love Prayer (see info below). A worldwide time chart is available to be sure you're synched with the rest of us (Major Love Prayer happens a half an hour before World Cry, btw). Also, please see our post 'You Are Not Alone on June 25th', for a list of ways to join with others on this day, in celebration, remembrance and love. Thank you and much LOVE to every one of you. Note: If for any reason you are not comfortable with any part of this suggested visualization experience, please continue as you normally would each month. Any love you can send into the world and grow within your own heart is 100% worthwhile. Thank you. 1) 2pm L.A. time... As we close our eyes and bow our heads, take some deep breaths and picture yourself glowing in light. Feel its warmth surrounding you. With all the love in your heart, reach out to Michael with deep gratitude for the life he shared with us. Tell him all you need to say, with love and with thankfulness. Thank him for everything... for the beautiful gifts of his love, his music, his inspiration, for the joy, the magic, the wonder, for his strength, his kindness, for all stood for and gave to the children of the world and so much more... Express it all, give him your love with as joyful an intention as your heart can bear. He can hear you. You are not alone. You are embraced in love. 2) After a few minutes, please become aware of all the others just like you across the world who are doing the same. We are all together. 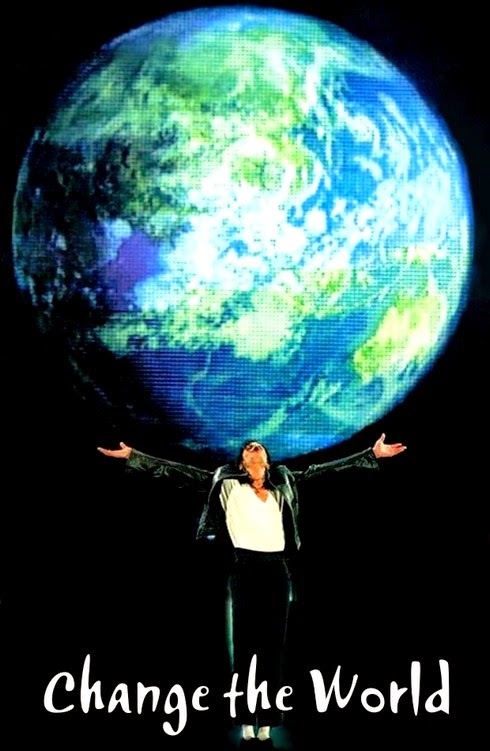 We reach out for each other and connect, all of us and Michael. WE ARE ONE IN LOVE. It's as if we are all held in a hug together within Michael's arms, he within all of ours, all of us together within the divine. This is pure healing, for every one of us. 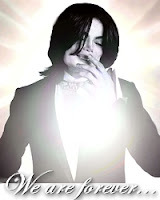 Ask that we all be healed now of the pain of Michael's passing, of regrets over his life, of any regrets we may have in ours related to him, of the pain of arguments or rifts within the fan community. Ask that we be strengthened with love and forgiveness for all that is to come. We are never alone. The universe is awash in light and unconditional love and those we have lost are never lost. They live within our hearts for all time and they live within that light, surrounded by love, surrounding us. "I am here with you..."
3) As a group now, operating as one glowing energy of love, let us reach out to others. Reach out with caring and comfort to Prince, Paris and Blanket, to Katherine and the family, to friends and our own families. Everyone needs healing. Everyone needs our love. Our love extends out to everyone. See our group's light expanding, expanding ... expanding as it grows across the world, encompassing everyone and everything within our embrace. WE ARE ONE PLANET, ONE IN LOVE. All are enveloped in a major, major love. See the Earth as if from space, glowing in pure love and light. You can feel this as long as you wish. When you are ready to end your prayer/meditation, thank everyone for their love and then feel the glow around you softening until it becomes a small, soft and warm energy just at the level of your perception. This gentle glow you will take with you in your heart always. Thank you and ~L~O~V~E~. Thank you, Michael. You are so loved. Always. Forever. We are yours. To play my part in the Major Love Prayer, I shall pray for peace and a safe conclusion to their freedom fight for the people of Libya and Syria; also for all the Lost Children, especially the little English girl, Madeleine McCann who was snatched from her apartment bed while on holiday with her parents and twin brother and sister in Portugal in May 2007. She was just under four years-old. On June 25th I shall be in London, and intend to visit Madame Tussaud's to see Michael's latest waxwork - again! If I get the chance to light a candle to pray, I shall do so, but it may not be at 10 p.m. This is just the most beautiful visualization and prayer. We will be at Forest Lawn connecting with all of you in this major, major love. Thank you so much for this. My heart is bursting with love already. Beautiful visualisation. I will actually be in my car on the way to World Cry Adelaide (early Sunday morning local time) at the time for the group prayer, but I will he doing this visualisation throughout the weekend whenever I can, and I am reading my own Prayer for Michael I wrote at World Cry Adelaide as part of the ceremony. I have sent the prayer to friends taking part in similar gatherings around the world - London, France, Germany and the US so as to make a circle of prayer for Michael. I hope my voice, and those of my friends, will merge with our global group prayer, for Michael, for his family, his Estate and for all of us who love him. I love you Michael from the deep of my heart! TWO years that you left us but it's seems like yesterday. In the reality I think you're still here, near us. Every time I hear a song or read a your message You're behind me. A prayer for love and a prayer for peace. In our present it is what we really need. It has been raining a deluge where I live and is supposed to continue right trough until Monday. I just finished my major love prayer with Michael and you all around the world, and was looking at the comments here when the corner of my eye saw shafts of light through the window! I rushed out to my balcony and the sun had broken through completely, very brightly - no word of a lie, I swear on my own soul. I sat and basked in it and thought "we are love" over and over and felt a golden, light-filled Michael holding us all in his intense love-embrace. This lasted for a few minutes and now the clouds have rolled back in, but I still feel him and YOU. I swear. I have had the weather channel on all day because I want to go out for groceries but it has shown no break in the weather, keeping the symbols at heavy downpour, which will start again soon as the sky is darkening. According to the channel it is still supposed to be incessant downpour until Monday. Thank-you Major Love Prayer for this experience and thank-you Michael forever. I love you. Dearest Michael, thank you just for being YOU, that was the most important. Love you for all eternity. No more words needed, simply THANK YOU ! My candle I light for you Michael in rememberence of everything good and compassionate you did for this world. You dedicated your life to us and served with honour and perfection in every endeavour you embarked on. What a wonderful example you have been. It has been two sad years & we miss you so much ... but I must believe that you have now been granted by our Heavenly Father .... Eternal Love, Peace and Rest after a life well lived. You remain treasured in my ♥ Sweet Angel. To Team Michael .... I felt you all from around the world with our Love Prayer. Stay strong and keep holding hands in UNITY for Michael, as that was his greatest desire.